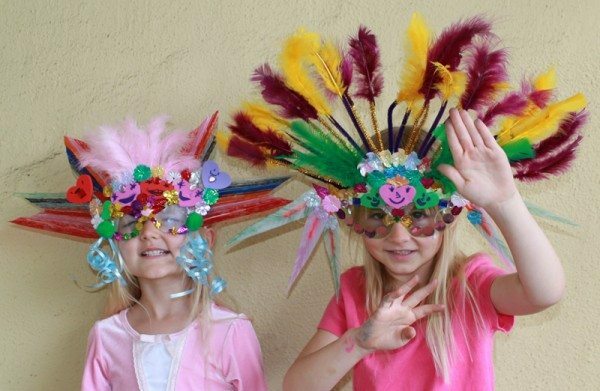 We like making Mardi Gras masks around here, because it gives you the chance to use up all the rogue odds and ends of craft supplies that you have lurking about from other projects throughout the year. 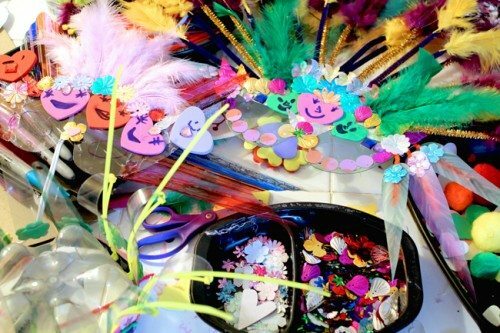 Left over valentine heart stickers, a few feathers and pipe cleaners, random pom poms and sequins, not to mention unusual left overs like zip ties. It’s also a good chance to dig in the pile of recycling to pull out cardboard and plastic items that can be re-purposed. I pulled together all the random bits and bobs we have to decorate with and loaded them up on the kitchen table, along with a couple of low temperature hot glue guns for the kids to stick things on with. 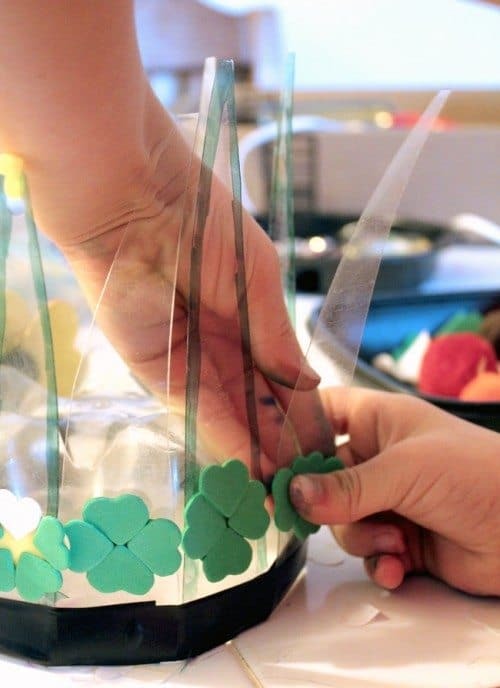 We gave up with white glue for this sort of crafting ages ago, because the kids just find it frustrating that things don’t adhere immediately and the time waiting for stuff to dry is unbearable! So if you’re not comfortable with using hot glue guns with your kids then I’d use double sided tape rather than white glue or glue sticks. 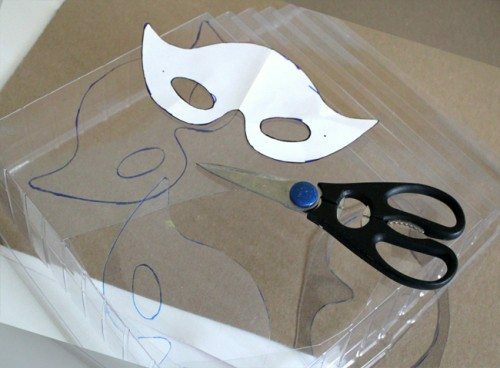 I rifled through the recycling to see what we had that could be used as the base for the masks and found a nice bit of clear plastic packaging that we could cut a base template out of. 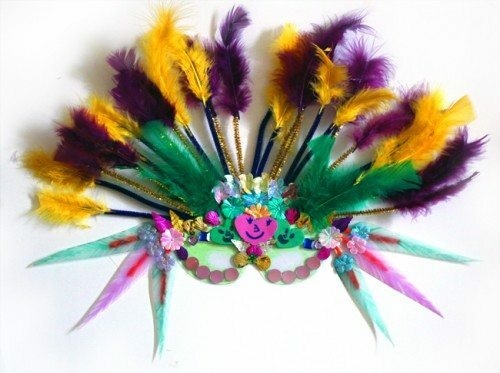 Here’s a Mardi Gras mask template for you. You could use anything for the base, cereal box cardboard would work just as well, but of course the clear plastic that we found does have the advantage that you don’t need to cut the eye holes out to see! 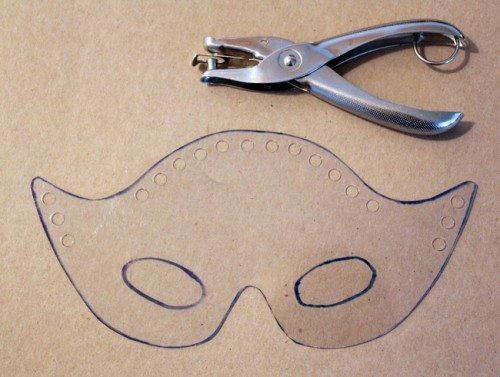 I hole punched a bunch of holes around the mask shapes so that the kids could twist pipe cleaners or put zip ties or feathers through them and then turned them over to the kids. 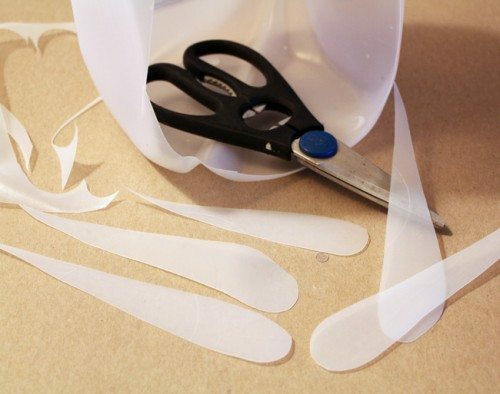 While the kids were gluing and decorating I also cut out some shapes from an old gallon plastic milk jug for them to use. Milk jug plastic is good for this because it is white and slightly textured, so it’s easy to draw on and color with permanent markers. 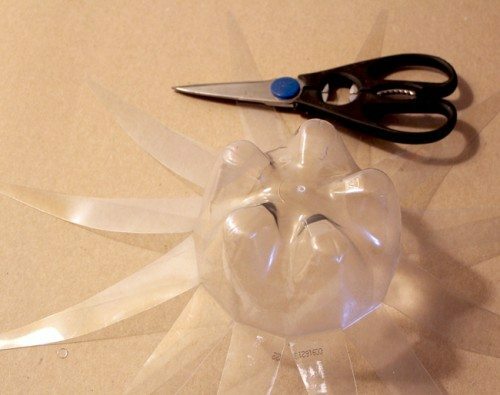 The other recycled item that we played with was an old soda bottle that I cut the top off with scissors and then cut the length of the bottle into spikes (with rounded ends for safety). 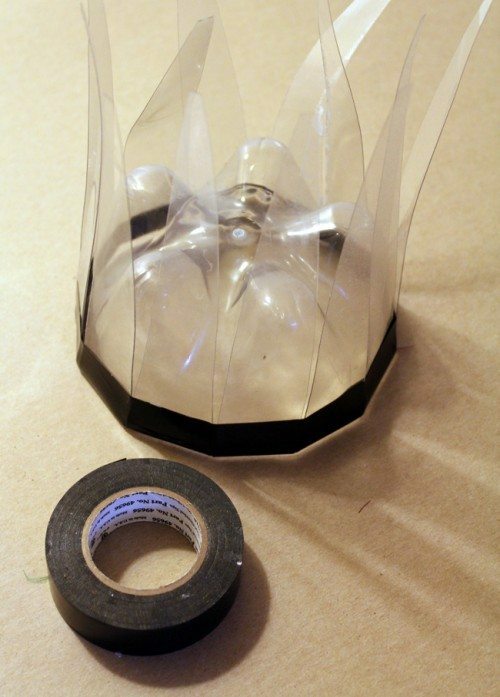 I folded the spikes back on themselves and used electrical tape to hold the folds in place. 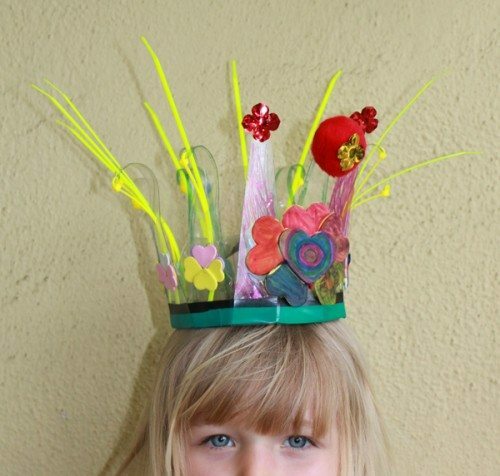 This gave us the base to make a Mardi Gras crown. My older daughter chose to make the left over heart stickers from Valentines Day into four leaf clovers to go on the crown, so I guess it turned into a Mardi Gras St Patrick’s Day crown?! My younger daughter had fun drawing happy faces on the hearts on the masks. These are the works of art that we ended up with. 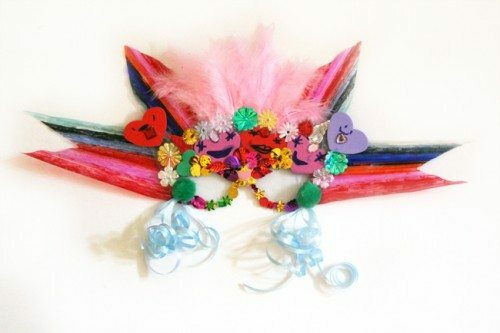 The colorful spikes on the mask with the pink feathers were made from cutting up an old piece of plastic packaging from a set of paint brushes and coloring it with sharpie markers. 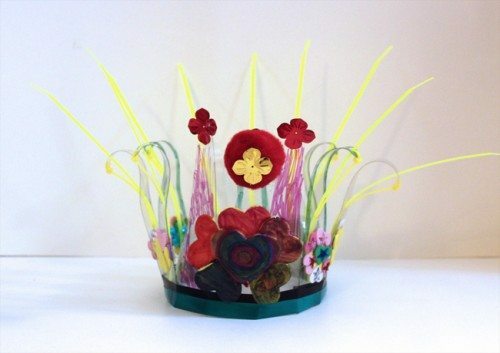 I really advocate going through your recycling bin and seeing what’s in there for this kind of craft. There are a lot of possibilities! 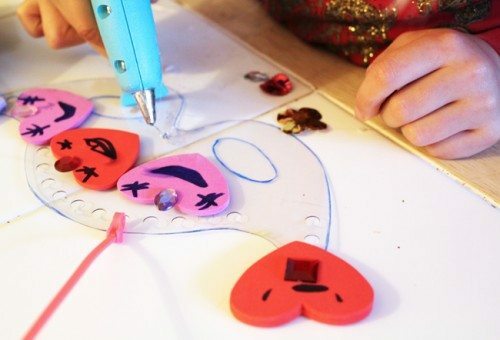 If you decide to use mostly cardboard rather than plastic like we have done then you will be able to use regular paint and pens, rather than having to use permanent markers to color. I’ll be putting ours up on the wall somewhere after Mardi Gras, because they are so colorful and extravagant that I’d be quite happy to look at them all year round!